It’s nearly end of the month, which means we are looking at some new numbers of the Windows 10 adoption rate. The latest Windows 10 Fall Creators Update has been seeing some quick adoption rate when compared to its predecessors. 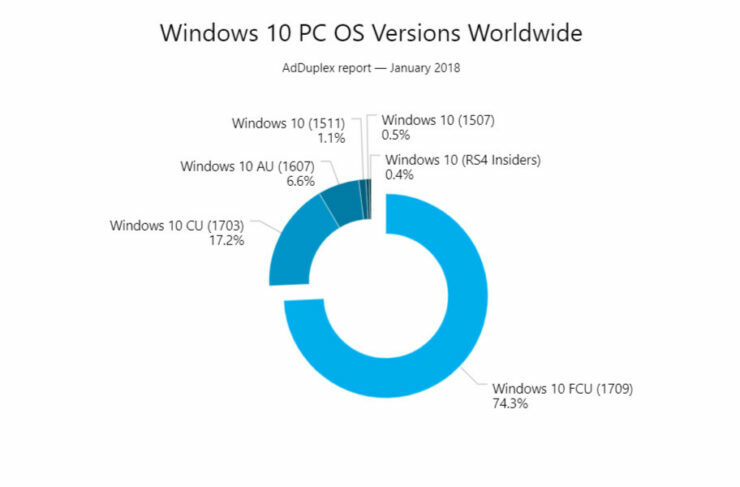 With Microsoft having opened the floodgates on the release of Windows 10 FCU which is now available for everyone, we expect to see a significant boost in its numbers ahead of the release of Windows 10 Redstone 4. According to today’s numbers by AdDuplex (with data collected until January 22), Windows 10 Fall Creators Update experienced another significant boost in adoption rate similar to last month. The version has jumped up from 53.6% to 74.3%. This is the fastest a Windows 10 version has been adopted except for the highly anticipated Windows 10 Anniversary Update. Following FCU is the Creators Update, which appears to be edition that experienced the biggest decline (thanks to FCU availability), now sitting at 17.2% down from 33.7%. Next is the Anniversary Update, which saw a drop from 10.5% to 6.6%. Finally, the Windows 10 November Update and the original Windows 10 version continue to tag along at 1.1% and 0.4%, respectively. As for the devices are concerned, third party products are catching up with Microsoft devices, with older Surface models and the Surface Laptop actually lagging behind. While all the other new Surface devices, including the Surface Pro 4, Surface Pro, Surface Book, and Surface Book 2, are topping the charts, Surface Laptop users are struggling to upgrade to Windows 10 Fall Creators Update, which is partly to be blamed on Windows 10 S and the lack of Media Creation Tool for the platform. As for other OEMs, Medion, MSI, Toshiba, and Dell products are actually ahead of Microsoft in this month’s numbers. Specific devices aside, Microsoft continues to get a better understanding of how to achieve seamless Windows 10 releases, with the Fall Creators Update having received the most positive feedback when it comes to stability.